Van de Weghe is pleased to present an exhibition of Andy Warhol’s Endangered Species paintings. 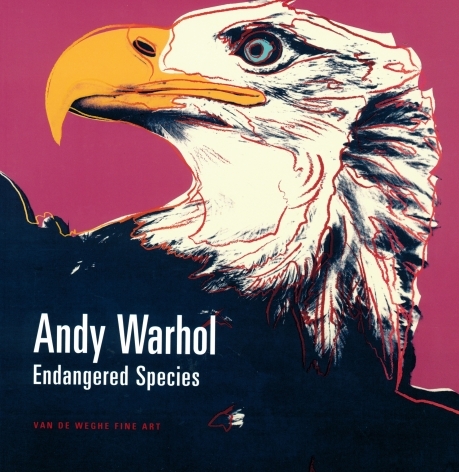 In 1983, Warhol made this series featuring ten endangered species from around the world. The gallery will show a selection of these works including Bighorn Ram, Bald Eagle, African Elephant and San Francisco Silverspot. While Warhol’s trademark silkscreen is the primary technique in these paintings, he used an overhead projector to trace the source image for the silkscreen, and there is a captivating interplay of this hand-drawing and the ready-made image he retains underneath. Warhol’s skill as a colorist is on full display in these works, which are almost psychedelic with vibrant hues. The butterfly in San Francisco Silverspot pulsates in an intense red specked with yellow, blue and green. The African Elephant is a striking interplay of crimson and blue against a yellow sky. Warhol referred to these works as “animals in makeup.” Indeed, the artist glamorized these rarified, exotic creatures in much the same way he did the myriad stars he made portraits of throughout the 1970s. The paintings celebrate these animals and immortalize them in a joyful amalgam of color and gesture. We can not help but be aware, however, of the precariousness of their situation and the likelihood of not only their death but their total extinction. While the Endangered Species fit thematically into Warhol’s oeuvre, he did care about the plight of these creatures. He collaborated with Kurt Benirschke, former Director of research at the San Diego Zoo, on the book Vanishing Animals, published in 1986, for which Warhol made a series of related prints to illustrate Benirschke’s text. Warhol understood the power of celebrity, and that by celebrating these animals, he could call attention to their struggle for survival. Following the passage of the Endangered Species Act in 1973, the 1980s saw an expansion in the reach of the conservation movement, with a handful of species recovering sufficiently to be delisted by the middle of the decade. The iconic Bald Eagle was removed from the endangered list in 2007. The other nine animals Warhol painted as a part of this series remain on it.